Yakutat, Alaska With a population of 615 nestled in the Tongass National Forest, Yakutat is a sight to behold. The Borough encompasses 9460 square miles of land. 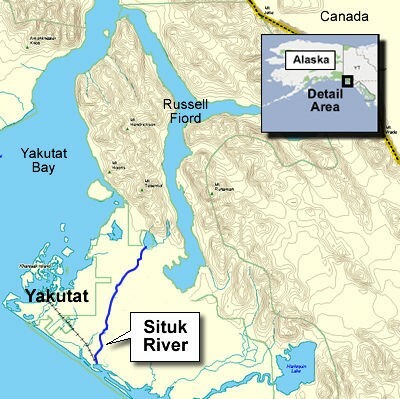 Yakutat has no road or rail access. The airport has daily commercial air service that connects it with Seattle and Anchorage. Alaska State Ferry also docks the Kennicott in Yakutat several times a month during the spring, summer and early fall. Mt St Elias soar into the sky reaching 18008 ft. It holds the title as the second highest mtn in the United States. She watches over Yakutats waters with a keen eye. Yakutat boasts the world renowned Situk River that lays claim to the best wild salmon run in Southeast Alaska. World class trophy steelhead to all 5 species of salmon in one river, the Situk River is one you must fish. Yakutat Bay sports some of the best salt water fishing in Southeast Alaska. With short runs to the fishing grounds in shallow water, one cant ask for anything better. Halibut, ling cod, rockfish and salmon all to fill your freezers. Yakutat Bay has all to fill a fishermans dreams with Captain Bill at the helm with an award winning attitude, it is guaranteed to be a trip of a lifetime. World Class barn door size halibut is always a possibility. There’s no better place on earth!